May as well propose it here – you just know that Neil Dawson’s “Chalice” sculpture is going to be suggested to be incorporated at some stage – and, well, you saw it here first. It is a symbol of hope – and that’s what the country needs most of all right now. Mayor Bob Parker says Christchurch’s iconic cathedral, which was badly damaged in the earthquake, was a stunning and symbolic building, but will be rebuilt. There will be a new and stronger city rising out of the ruins and it was realistic to start thinking about it. He would not rule out the need to knock over whole blocks of the city and some of the character buildings they would have once fought for may have to go. I wonder if the remains should be strengthened and then left spire free. I saw something similar in Berlin. It could be a memorial for the victims of the earthquake. I’m convinced that Christchurch is due for significant downsizing. CBD jobs just don’t exist now. They’ll either return in months when the cordon is lifted. Or in years when new buildings are constructed. In the mean time business will either relocate or go bust. How many people are going to wait that long, living in a ruined house, pooing in their garden, collecting the dole? I’d take the insurance money and head for Australia and I suspect plenty of others will do too. My prediction: Christchurch will lose at least 100,000 people by the middle of the year. The replacement CBD will look more like that of Hamilton or Tauranga than what was there before. Really cool idea Max. I agree, it shouldn’t be rebuilt exactly the same – that would be denying history. This building represents christchurch doesn’t it? So better if it can reflect the day that everything changed. David P – I think you’re right on all those accounts. Those aftershocks are enough to drive anyone to want to leave, and the next big city they’ll go to is Auckland, not us (come to Wellington to escape the earthquakes!). There was an absolutely idiotic comment on a story in the Herald about rebuilding. The comment said something to the effect that is the taxpayers of the whole country are going to be required to pick up the tab for the reconstruction effort than it should be mandated that christchurch be moved to a safer location. ??? where exactly would that be? It had been historically thought of being in one of the the least prone earthquake zones. and do I need to remind anyone that the ENTIRE country sits atop a gigantic line of seismic activity? Short of moving Christchurch to South Dakota or something, how exactly would we do this? You notice one obvious problem with that idea. The second is that there will still be 100,000 inhabitable homes there and we just can’t write off that amount of real estate by moving everyone out. It’s an interesting problem. Economic activity in Christchurch is going to crash overnight and won’t recover for a while. I doubt if anyone will want to construct new CBD-like buildings (tall, lavish) in a city that is experiencing a down-sizing population AND economy. It will probably be easier to start constructing new office and commercial buildings in the suburbs where you can begin quickly, rather than waiting for the CBD clean up to finish. So… maybe we’ll end up with a city the population of Hamilton but with a CBD of even less consequence… sort of a 200,000 person city modeled on Los Angeles with commercial activity in clusters all over town. There are questions that Wellington and the country needs to address, and not the obvious ones about building strengthening. Modern hi rise buildings are designed to flex and warp in an earthquake, saving their occupants but writing themselves off in the process like the 26 story hotel has done. Could we afford to write off Wellington or Auckland CBDs in a large earthquake, even if no building actually collapsed and no lives were lost? Can the country afford to lose most of the public service if Wellington CBD is next hit? I think we are going to have to look at decentralisation of government and essential services. Whether that means we have to spread government activity out to the Hutts and Porirua or further afield I don’t know. But I’m not comfortable having it all clustered around Molesworth St.
Napier used to be a splendid sea side town with a vast inland sea and 3=storey high brick Victorian architecture in the centre of town. Following the 1931 quake, when the entire CBD was destroyed (99% of all buildings gone, which is more severe than the doomed 30% of Christchurch’s architecture being talked of), the people / council / government also discussed whether the area should be abandoned and rebuilt elsewhere. After a week or two of thinking, they announced that the city would be rebuilt – and it became, in the words of Peter Wells’ film, the “Newest City on the Globe”. There was no conscious intent to rebuild in a “Deco” style – that just happened, without them really realizing it – they were just building in the newest, safest, most modern style that they could get their hands on. But one thing stands out – they did not try to rebuild anything in the Victorian style, nor did they build tall: every building in Napier’s CBD is now only one or two storeys high. Global changes in shopping patterns being what they are, we’re likely to see even more suburban shopping going on in Christchurch in the future. Someone said to me just recently that their mother still will not shop in Ballantynes department store in Christchurch because of the fire there in 1947, where 41 people died – people have long memories. That’s a miserly $60million for 30,000. If a local shop is ruined then drop a container outside and keep on trading. If a house is ruined and the owners intend to rebuild then park a container on the road or the front garden and provide temporary housing. Stack them up (not too high) in Hagley Park and let CBD businesses move in for the duration. Fit some out as toilet blocks, shower blocks, and laundries. That’d restore commercial activity and employment. In a couple of years time you’ll have had time to rebuild and people can move back in to the CBD. The containers can then be moved to somewhere dry… Alexandra perhaps, or to Alice Springs. They can be stored for next time, or loaned out to other disaster areas. Again, there are some parallels with Napier here – when their CBD was completely demolished, they built a temporary shopping area in nearby Clyde Square which stayed there for 2 years (made of corrugated iron sheds, they called it Tin Town). When the 2 years was up, they had rebuilt the city and the citizens could all move back in. They’ll need to do something similar in Christchurch – perhaps even to the same extent of building a new centre elsewhere, as there will be so much demolition and rebuilding in the CBD. I’ve been wondering about this ever since the volcano threat to Auckland was explained to me. Shouldn’t we try to direct our population growth and spread it around a bit more, rather than 75% of it going straight to New Zealand’s great single point of failure: Auckland. Imagine taking over a third (and creeping towards half) of the country offline after an event — it’d be massive migration to Australia, and lights out for NZ for half a century, and we’d probably have to exercise our option to join the federation. I guess economically, etc, it’s great to have everyone in one place, but it seems like a big risk. erentz>I’ve been wondering about this ever since the volcano threat to Auckland was explained to me. Aucklanders have told me that there is nothing to worry about since the volcanic field has migrated offshore… that the next volcano will pop up somewhere near Rangitoto. I checked this out with a guy from GNS a few months ago when I was passing Te Papa and they had a display set up there. He said that my story was rubbish. There is less tendency for new volcanoes to pop up directly under old ones, but apart from that it is completely random. Building a city on top of a volcano field is just mad. Just can make a building survivable against all but the very largest earthquakes, but if a volcano pops up under your CBD then it’s game over. Whilst your design proposal is tres moderne I suspect that it will go down like a cup of cold sick with the locals of a self-confessed conservative city. The words “ice cream cone” may get mumbled in an aggrieved fashion. I suspect a replica reinforced steeple with brick facings may be more welcome? Apologies in advance for assuming the popular choice may err on the side of boring..
hell, why go as far as brick facings. Make the whole city an EIFS replica of what was there before. Then we can all pretend like everything is just like it was and nothing happened, and know that when the next earthquake happens it will just be cheap polystyrene falling on people’s heads. “Once the search for victims of the Christchurch earthquake is over, a demolition operation will clear the central business district (CBD) to make it safe, Earthquake Minister Gerry Brownlee says. Older buildings in the central area fared poorly in Tuesday’s 6.3 magnitude quake, with structural engineers predicting half of those of brick construction will be written off, while 25 percent had already collapsed. Mr Brownlee said there were no plans to ease the safety cordon around the central city, as older buildings have damage and were unsafe. Aftershocks overnight were causing more damage and making it more difficult for search and rescue teams. Once bodies had been recovered there would be “a very big demolition effort across the CBD area”, Mr Brownlee said. “Sites will have to be cleared so that people can have confidence it’s safe to come back into the CBD,” he said. – “For some months” ALL services “would have to relocate” ? if they do that, its the absolute death of Christchurch. They need to allow peopl back into the city NOW – by next week at the latest. I reckon that with Commissar Brownlee in charge there’s going to be some Las Vegas-style explosive demolition of the main slumped hotel at least and plenty of twenty-tonne diggers reducing brick buildings to rubble in short order. I don’t think that is a very helpful premise, especially given the massive loss of life in the CTV and Pyne Gould buildings, which suggestions indicate have probably contributed to the death toll by the greatest amount. I do, however, agree with the general thrust, that unsafe (not just old) buildings need to be taken out as soon as practicable. I’m pretty sure that strengthening the damaged buildings to contemporary building codes (NOT a percent thereof) is just not feasible, and that immanent changes to EQ building codes will head in that direction. Given aftershocks and the likelihood, dare I say it, of another massive shake over the coming months, we just don’t have the luxury of sitting wringing our hands over heritage. There is a comment from the MD at Colliers today, about building a new CBD on Hagley Park. The new commercial buildings would be low-rise (presumably 4-5 storeys) and would be built amongst the greenery of the park. A new city park would then be created where the crumbled CBD lays now. Probably a bit far-fetched, but if, along with the greenery and modern low-rise buildings (and I’d hope for a bit of imagination on the design front), it focused less on main roads and more on an extention of the tram network, walk/cylcleways and shared spaces, a cool, modern city could rise from the rubble. m-d – ain’t necessarily so – virtually any old building can be strengthened adequately, its just a question of time and money. Certainly easier to do in Wellington, where our buildings have not yet fallen down. Very hard (but not impossible) to do in ChCh where buildings are in an unstable state. The question has already been asked though – who pays? m-d… The trouble with building a permanent CBD in the park is that there will still be structures in the old CBD, so you won’t be able to turn the old CBD in to parkland. I don’t think we can rely on new building to restore commercial activity in Christchurch. Even if it takes 6 months, business will have moved or folded. Hence my container city idea of a couple of days ago. You’re probably right, but I still like the idea. There could also be buildings in the memorial park for that matter too (although I really have no idea how many that would be post structural assessment…). Will be interesting to see what happens with sites like the CTV building. Some people are funny about building/buying/renting places where people have died. And alot will have perished at that site when the final toll is determined. I wouldn’t mind betting that the council buys some of these sights and “greens” them as a kind of memorial. The result might be a scaled down version of the CBD proposed for Hagley Park. New pockets of greenery all over the city centre. Ho about something like this? It’s an openwork spire in a Gothic Art Nouveau style. “Built in 1925 and designed by noted Pittsburgh architect Henry Hornbostel, the current Smithfield United Church of Christ is home to many architectural marvels. Yet none are more striking than the building’s crowning glory: the spire. Constructed of aluminum with steel supports, the 80-foot high spire has the distinction of being the first architectural use of aluminum in the world. “The spire is both powerful and delicate, a rare balance in an architectural feature,” notes church archivist Donn Neal. The original design called for the entire spire to be made of aluminum, but building codes coupled with the relative uncertainty of aluminum as a building material dictated otherwise. In the end, the spire frame was built of steel and the panels were made of aluminum. The tragedy is that we do not learn from history. There is a reason why all the outer eastern suburbs have been trashed so badly by this quake – because they were built on geologically unstable soil. People / developers took a risk building there – that risk has paid off for over 100 years – now it’s payback time. Max>There is a reason why all the outer eastern suburbs have been trashed so badly by this quake – because they were built on geologically unstable soil. 1. Anywhere near a fault. 2. Especially the honking big Alpine fault. Or Wellington. 3. Anywhere near a volcano. 4. Especially the Taupo super volcano. Or Auckland. 5. Anywhere on top of a hill where you might turn in to a landslide. 6. Anywhere at the bottom of a hill where you might be crushed by a landslide. 7. Anywhere on sand, silt, or drained swamp due to liquefaction. 9. Anywhere near to a river. 10. Anywhere near the coast due to storm surges and tsunamis. 11. Anywhere on reclaimed land due to liquefaction. So where can we build so that we don’t turn in to the next generation of people who failed to “learn from history”? Phew! Thank goodness for that. I was worried that the answer might be Palmerston North and that being buried under tonnes of fallen masonry wasn’t actually the worst option available. 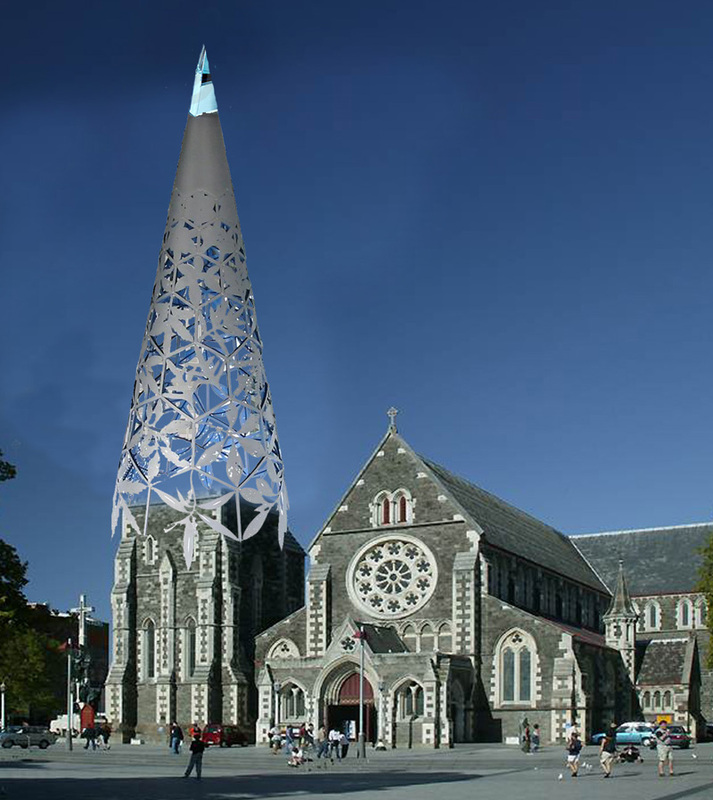 There’s no place for a gimmicky ice cream cone replacing the Cathedral Spire. If engineers can’t design an earthwuake proof stone replica then it should be in timber to reflect the original style and colonial period in which it was built. Timber with a stone facade base and wood shingle or wood/copper shingle facade would fit in OK if it was necessary to move away from stone for the spire. Stephen – please note that I was being ironic, and am not really suggesting the chalice – i just wanted to put up something to signify that we may need to rethink our attitude towards the old. In this case, I’d go for something new. The choice, of course, will be with the people of Christchurch – the steeple has partially fallen down at least twice before, and the last time the top of it was not replaced in stone, but in timber. Personally, after a quake like this, I would have thought that Cantabrians would be wary about entering stone or brick buildings ever again. The spire would probably be best re-constructed with a strong steel framing structure to resist seismic forces, and then an outer cladding applied. Again, personally, I’d opt for a structure that was at least partially glazed, to show the steel structure and give reassurance to people that it won’t fall down on their heads again.